Our bodies require food and many of us are searching for more natural ingredients for healthier eating. One of the messiest jobs in my kitchen can be trying to make my own natural food coloring. More and more people though are attempting this given what research has shown about artificial colorings, such as delays in learning and developmental disorders and harmful affects on children with autism. Not to mention the effects on children with ADHD like my co blogger's boys. Natures flavors is a company whose mission is to spread the natural and organic bounty of nature through their products. For over 25 years Nature Flavors has been a leader in nutritional wellness, with over 8,000 natural and organic products. They have allowed us to review their Rainbow All Natural Food Coloring. Rainbow All Natural Food Coloring is 100% natural. All products are USDA certified and free of toxins, chemicals and synthetics. Natures Flavors provides vegan kosher, gluten free, alcohol free and non allergic products. The pack contains 5 colors cherry red, natural blue, natural honeydew green, natural yellow and natural pumpkin. Their colors are perfect for coloring cold food, baked food and beverages. The colorants are water soluble meaning any mess is easy to clean and no staining. I decided that I would review the product by making a cake. Had the cake been made for something special I would have worried a little that the heat would cause the color and consistency to come out differently. I was delightfully surprised to find it a beautiful shade of red when it was done. I have also mixed it up in other home made icings and love the colors I have made. Not to mention how much easier, at least for me, clean up is, and no staining on my dishes. My children don't notice any difference, they are still loving the goodies, and I'm happy that their no longer getting the chemicals that are in synthetic colorants. 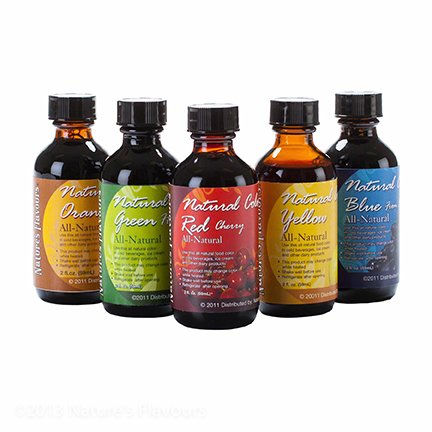 I'm completely satisfied with Natures Flavors Rainbow All Natural Food Coloring. I am so excited for the different holidays to arrive. I want to make pumpkin color frosting for my pumpkin cookies. Santa hats on my Santa cookies, pink hearts for Valentines and have some great fun dyeing multi colored Easter eggs with my grandchildren.